Equity futures are lower this morning with the dollar higher, bonds higher, oil lower, gold & silver mixed, and food commodities also mixed. - Substitution bias occurs because a fixed market basket fails to reflect the fact that consumers substitute relatively less for more expensive goods when relative prices change. - Outlet substitution bias occurs when shifts to lower price outlets are not properly handled. - Quality change bias occurs when improvements in the quality of products, such as greater energy efficiency or less need for repair, are measured inaccurately or not at all. - New product bias occurs when new products are not introduced in the market basket, or included only with a long lag. Adjusting for these supposed biases, they are then able to say, for example, that because the car you purchase today is better than the car you purchased 10 years ago, that the increase in the price of the car is partially offset by the addition of those better features (like many safety features mandated by the government). Of course you are driving a better car, but in the end it’s still just a car that is used to get you from point A to point B. And you no longer have access to buy cars for what they used to cost, it is now impossible to buy a car that has not inflated in cost. They apply this same logic to almost everything – if steaks get too expensive, no problem, they simply remove steak from the basket and replace it with hamburger (because that’s all you can now afford because of inflation, lol). And substitution bias is just one of many ridiculous hedonistic adjustments. Doesn’t that term “hedonistic” (self-indulgent) fit perfectly for these types of adjustments? It does because these self-indulgent adjustments are made by the narcissists who really run this country. Many credit Bill Clinton for the Boskin Commission adjustments, but the truth is that Bill didn’t dream this fantasy up all by himself, oh no, I can guarantee you that those interested in seeing the fantasy system perpetuated are the ones who really dreamed it up and simply used their bought-and-paid-for politician to sign it into being. Once the data, then, is skewed towards underreporting, then reality and fantasy begin to diverge. At first this divergence is hardly noticed, but then the slippage begins to accumulate, one lie mathematically piled on top of the next. This produces exponential growth, and the next thing you know the reality gap is growing so fast that it pinches the people in their pocketbooks – reports of 1% or 2% inflation don’t match the reality of $14 hamburgers. 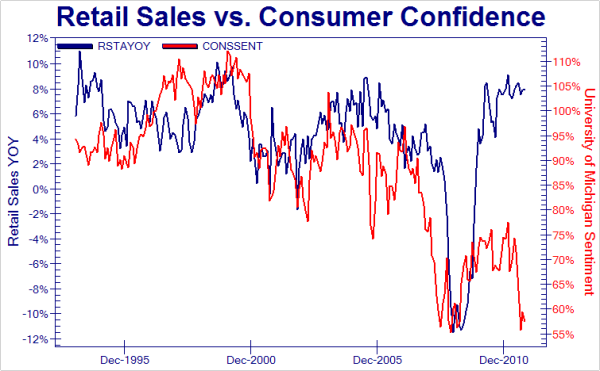 The reason I’m revisiting this MUST UNDERSTAND concept was a chart posted on Zerohedge last week showing Friday’s Consumer Sentiment, which cratered, and Retail Sales which magically rose 1.1%! This reality disconnect is directly related to the inflation measurements – Retail Sales are measured in dollars, made “real” (not real), and also contain their own substitution bias because only same store sales are counted which do not reflect the missing sales from stores gone out of business. For example, Lowes just announced this morning they are closing 20 stores that will affect almost 2,000 workers. The Retail Sales report will miss the fact these stores are no longer open and that most of their sales are picked up by other stores – if you close all the home improvement stores in the nation but one, then you would say, “man, look at the Retail Sales soar!” How ridiculous would that be? Of course we possess the technology to track sales instantly, but don’t because those who profit from the current system want to perpetuate that myth that all is well. And that’s why you have a historic disconnect between reality and fantasy. That is why you have politicians and bankers saying no recession when in fact the people of America know better, they can feel the squeeze that they are caught up in. Think about that chart in another way – retail sales soar because of inflation, while consumer sentiment plunges because of the same inflation – “consumer’s” income is not keeping pace with that inflation and thus they are depressed amongst reported inflation. Of course once this reality gap grows too big, then you have people out on the streets, which is exactly where we are today. The root cause of this reality disconnect traces directly back to WHO it is that is allowed to control the production of money. If the people wish to truly end the fantasy then they must strive to recapture the money production power – it is rightfully theirs, that is the natural rule of law, and the proper order to the economy! Business conditions in the New York manufacturing region are contracting for the fifth month in a row according to the Empire State index for October which shows little change at minus 8.48 vs September's minus 8.82. Positives include new orders which at plus 0.16 show a fractional monthly gain to end two months of contraction. Shipments, at plus 5.33, show a moderate monthly gain. Also positive is employment, at plus 3.37, to indicate a mild monthly rise in the sample's workforce. Now the negatives. Unfilled orders, at minus 4.49, are contracting for the fourth month in a row. Manufacturers in the region have been keeping shipments and employment up by working down backlogs which however are becoming increasingly thin. Inventories, at minus 8.99, are contracting for the fourth month in a row suggesting that the region's manufacturers, hit by weakness in new orders, see their inventories as too high. Delivery times, at minus 1.12, have been getting a bit shorter hinting at over capacity in the shipping sector as truck and rail firms chase fewer and fewer orders. Pressures on both input and output prices are easing in what is also consistent with slowing conditions. Another negative is the six-month outlook which at 6.74 is down from 13.04 in the prior month and is at a new low for the recovery. This echoes other readings on sentiment, including those on consumer sentiment, that spirits are unusually depressed. The next look at this month's conditions in the manufacturing sector will be Thursday with the Philly Fed's report. No doubt about it, a negative reading, one consistent with recession (from already recessed levels). Manufacturing-especially autos-continues to lead industrial production. In September, industrial production advanced 0.2 percent, following no change the month before (originally up 0.2 percent) and a 1.1 percent jump in July (previously up 0.9 percent). Analysts had projected a 0.2 percent rise for September. By major industry, manufacturing improved to a 0.4 percent rise after a 0.3 percent boost in August (previously estimated at up 0.5 percent). The auto component increased another 0.7 percent after a gain of 1.5 percent in August. Outside of autos, manufacturing is still healthy. Strength was in durables as nondurables declined marginally. Excluding motor vehicles, manufacturing rose 0.3 percent, equaling the pace for the prior month. In other major sectors, utilities output fell 1.8 percent after declining 2.9 percent in August. Mining output expanded 0.8 percent, matching the growth rate for August. On a seasonally adjusted year-on-year basis, overall industrial production was up 3.2 percent in September, compared to 3.3 percent in August. Overall capacity utilization in August improved to 77.4 percent from 77.3 percent in August (originally 77.4). The September rate was slightly lower than analysts' estimate for 77.5 percent. The manufacturing sector continues to post better numbers at the national level than in many regional surveys. Gains continue to be moderately healthy and somewhat broad based though more in durables than in nondurables. On the news release, equity futures were mixed and little changed compared to prior to the release. The earlier released Empire State manufacturing survey was a little disappointing and weighed on equity futures. You catch that “real output,” and remember what “real” means? It means that they measured Industrial Production in dollars and then adjusted for “inflation” (measured their way) to make it “real.” And so it’s not real! It’s BUNK. And that’s why you have one report that’s negative and one report that’s positive – one is really real, and the other simply is not. Yes, I do know how to fix this. The people on the streets need to create the void and then ensure that people like me are put in place to take the proper actions – people with no special interest who will work on behalf of humanity and are not interesting in controlling the planet for their own personal narcissistic power trip. Speaking of fantasy, the leaders of Europe and the G20 are up to their necks in it. They meet this coming Sunday are going to decisively, once-and-for-all, swiftly, permanently, and above all “unitedly” print money, give it to the insolvent banks, and put the people of Europe (and the U.S.) on the hook for it all! Or not. Well, maybe. Oops. I think we’ve seen this fantasy before. Buckle up, the void is coming and that void is the critical juncture in history, probably for this millennium. It can swing either way from there, be careful what you ask for. Monetary Madness – The Real Money Bomb!